On Saturday, I had the remarkable experience of visiting a temple very few people (especially visitors and tourists) have ever heard of. It is called Chao Srey Vitbol, or Beautiful Granddaughter, and the aerial photograph above shows how huge it is. My husband, Don, and I had the good fortune of going there with my friend, the author and Angkor scholar, John Burgess, and his wife, Karen. Anyone with any interest in Cambodia really should read his books, which range from historical fiction to nonfiction history. To be able to visit this temple complex with John as our guide, was a huge treat. No one is completely sure about anything having to do with this temple. 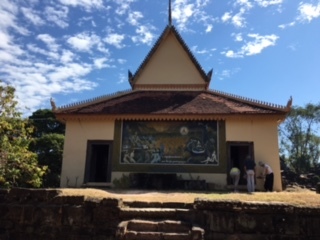 Some say it was built in the early Angkorian period, several hundred years before Angkor Wat. Perhaps around 800 A.D. It is built on top of a hill around 5 kilometres from some of the most famous temples, in what is still a remote and sparsely populated rural area. Hills in this part of the country are rare, and hills were always sacred areas in Hinduism and Buddhism. So, from a religious point of view, it is not surprising that this temple was built there. You begin by walking on a path which takes you from the empty car park area to the top of the hill. There is a guard there from the Apsara Authority, but it’s clear he didn’t expect any visitors. The first thing you see, though, is a beautiful, relatively new pagoda. The building itself is large and lovely, with beautiful murals on the outside. But the inside is spectacular. 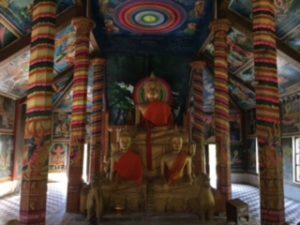 The walls and pillars are covered with brightly colored paintings of stories from the Ramayana and tales of the life of Buddha. The statue of Buddha itself is really magnificent. We had the place to ourselves, until a spirit-like man came in to clean. He had very long, uncombed hair and was naked except for the krama, or traditional scarf-like cloth, around his waist. He carried nothing except a straw brush which he used to hit against any gathering cobwebs. To be honest, if I had been alone, I might have been frightened. But clearly, he was harmless, although, perhaps, wild and a bit crazy. We spent some time in the modern temple, but as beautiful as it is, it wasn’t the star attraction. 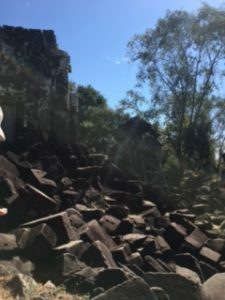 The star attraction was standing, or lying, right behind this.The ancient temple of Chao Srey Vitbol is barely reconstructed or renovated at all. Much of it is lying on the ground as heaps of fallen stone. Elements of the main temple structure are standing, but most of it lies on the ground as blocks of stone which you need to clamber over. But if you do, you are rewarded by pieces of beautiful carvings. We felt like explorers, as we found bits of figures here, bits of decoration there. My great find was a lion’s (?) claw lying upside down on the ground, clearly the leg of one of the animals guarding the entryway to the temple. We were alone as we discovered the temple, imagining what each stone could mean, where it might have stood. John explained that we were seeing many of the traditional elements of these holy structures, and pointed out where the gates would have been, the libraries, the towers. Amazingly, very little work has been done on the history of the temple, and the work that has been done has led to only a limited understanding of what stood on that hill. The few scholars who have bothered with this place have come up with very little that is definitive. But, of course, the local people living there have their own ideas, some in agreement, some not. As we looked and wondered, though, we realised that we weren’t alone after all. Every now and again we would spot a guard, or a local native serving as a guard, standing quietly a few paces behind us. None of them spoke any English, and my rudimentary Khmer necessarily kept the conversation on a very superficial level. 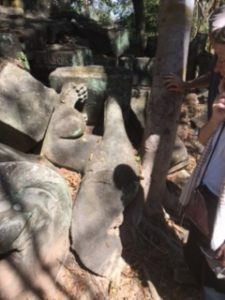 But we came to realise t hat the guards were there, not to make sure we didn’t steal anything, but rather to ensure that we aging barangs (foreigners) didn’t hurt ourselves as we played archaeologists. And rightly so, because after we looked at the main temple, we started to see other buildings down below the slope, places we just had to explore. So, of course, our fearless leader, John, led us down the slope to look at a ‘mystery building’ which might have been a dormitory for monks, or perhaps a site for more complex rituals, or perhaps even a place for bathing. Three long attached buildings stood in a flat area. You could stand at one end and look through to the view behind. On the side were remnants of spouts that are usually used to pour the holy water from inside a temple to the profane world beyond. No one knew what this building was for, including us. But it was great fun to speculate. 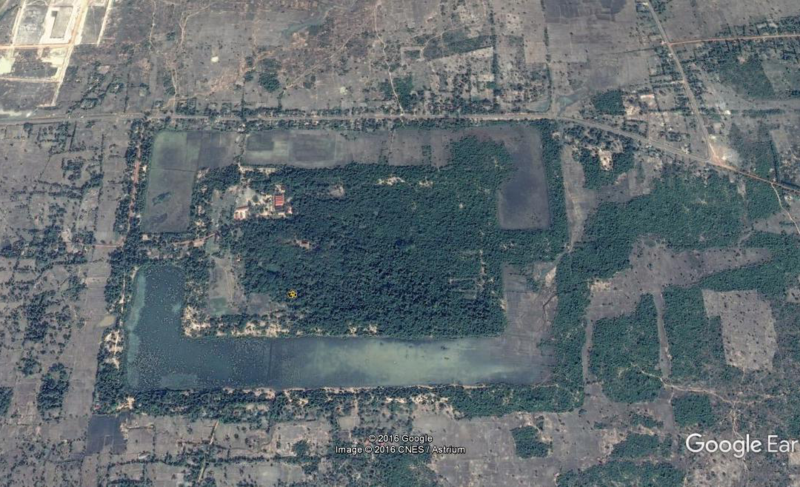 Behind it was a man-made lake or reservoir, which was one of the most important engineering feats of the ancient Angkorian people. In a land where the rains come only a few months a year, it is important to capture the waters and use them, for everything from bathing to drinking to irrigating the farm land. Or to be transformed into holy water. From there, we walked beside what would have been the large square wall enclosing the entire temple precinct. Although the buildings were deserted and lay in heaps of rubble on the ground, remnants of the wall and four gates remained and the paths were clear. It was easy to imagine the hundreds, if not thousands, of people who must have lived, worked and worshipped in this place hundreds of years ago. 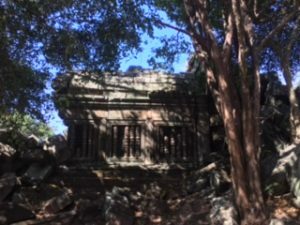 It is just as easy to imagine why they were there, which King decided to have this temple area built, and even, who was the Beautiful Granddaughter, and why was this large complex named for her. Between my own novels and my work with Writing Through, my concentration is focussed on the lives of Cambodians today. I love going to the temples and learning about the past, but it is far from my expertise. But John Burgess’ interests concentrate on Cambodian history. We are two writers in love with the same place but approaching it from different moments in time. Being able to spend a day experiencing this country beside him was a real treat. And I’m sure that bits of what I saw and felt will turn up in a poem or novel of mine sooner or later. Wonderful! Will put this on our list to visit next time!